I turn 23 today!! I am celebrating with my family and husband after work. My mom is making me a great meal! Can't wait! I first reviewed Boca Java earlier this year and loved it! I tried the maple bacon morning coffee and it had a light taste of smokiness. This time, I chose three coffees including ocean drive, frosty's favorite and vacation villa vanilla. I recently tried the vacation villa vanilla. It is a light roast flavored coffee. One 8 ounce bag of coffee retails for $7.99. It has a nice vanilla flavor that is perfect with skim or 1% milk. When the coffee was brewing, it smelled awesome. Something unique about this kind of coffee is that it is roasted right before it is sent out. Black Friday is my favorite day of the year and this year, Boca Java has a great special running. 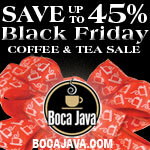 Go to Boca Java to take advantage of Boca Java's black friday deals. On 11/23 - you can save up to 45% on Gourmet Coffee, Tea and Cocoa. The giveaway will be for three bags of your choice of Boca Java coffee. I WOULD LOVE TO TRY THE WHITE WONDERLAND COFFEE ! The Light Up Las Olas Coffee! White Wonderland or First Snow. The names are catchy. I would love to try vacation villa vanilla. The Maple Bacon sounds wonderful! The Maple Bacon Morning Coffee sounds interesting.